Green tea is revered not only for its health benefits, but also for its delicious flavor. 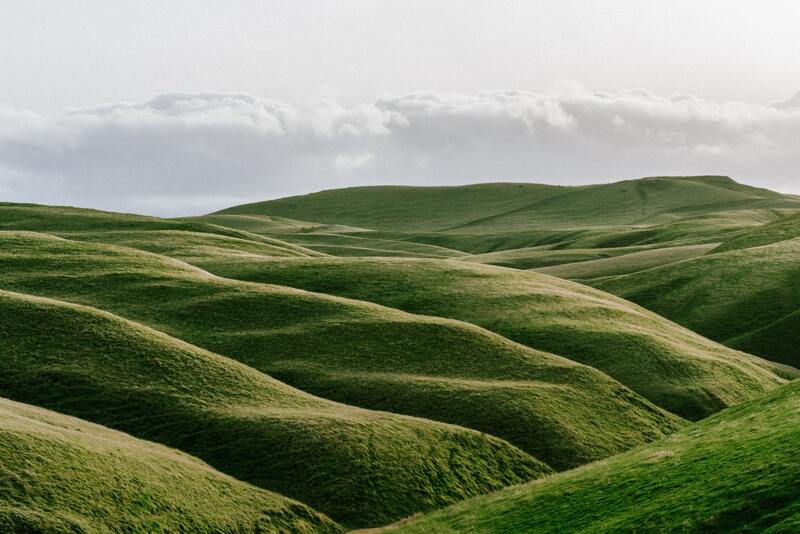 The earthy aromas and grassy flavors inspire your sense from the first whiff to the last drop. Green tea has become synonymous with Japan. It's commonly served at restaurants across the country and is the staple of food trends. You can find Japanese green tea in everything from matcha green tea lattes to ice cream and even chocolate bars. Japanese green teas are unique from Chinese green teas. They boast special characteristics in flavor and history that deepen the tea drinking experience. 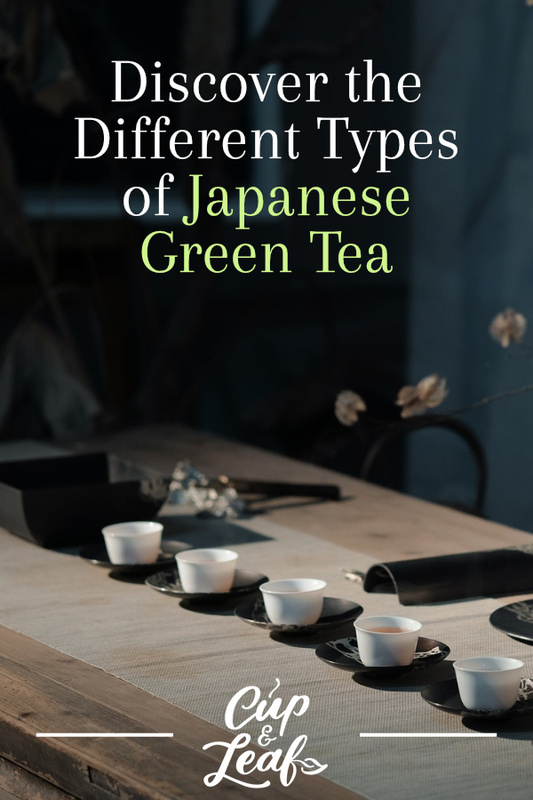 Find out what makes Japanese green teas so special and learn how to choose the best ones. Green tea made its way to Japan from China via traveling monks. Japanese monks spent time studying Buddhism in China where they were introduced to green tea beverages. Thee Buddhist monks brought the green tea back to Japan during the Nara and Heian era more than a thousand years ago. Originally, only royalty and elites consumed green tea in Japan. Over the years, green tea production increased and its popularity soared. During the 12th century, a priest named Myoan Eisai published a book on the preparation and consumption of green tea. This brought green tea to the masses where it has become a staple of Japanese society ever since. Today, Japan consumes copious amounts of green tea. 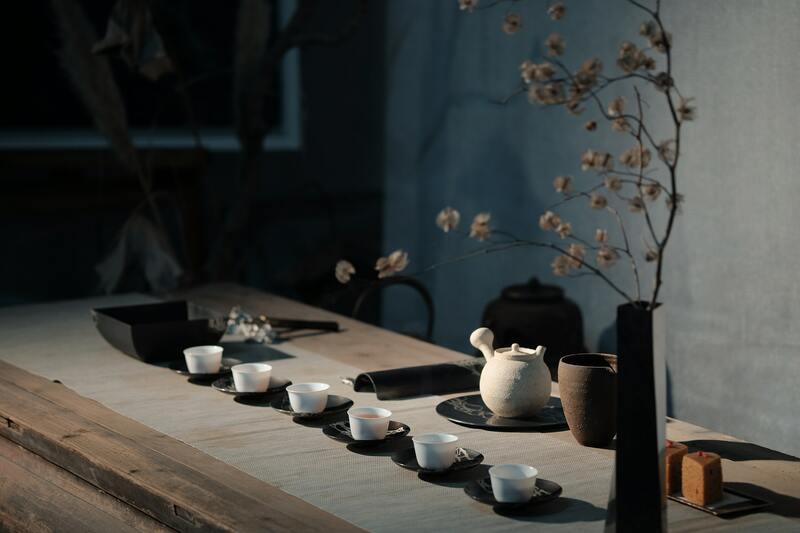 It is an integral part of the Japanese tea ceremony where green tea is consumed using traditional teaware. Japanese green teas are served at the highest levels of government and are a key part of welcoming foreign dignitaries and guests. Japanese green teas consist of a wide range of teas. They offer grassy and earthy flavors and are characterized by their production methods. Read on to find out about the different types of Japanese green tea. Sencha tea is by and large the most commonly consumed green tea in Japan. Sencha green tea is the type you will find at most restaurants in the country. This tea is made using only the youngest tea leaves of the tea plant. Sencha green teas are available in affordable varieties as well as high quality teas to suit connoisseur tastes. The leaves are plucked and then steamed to prevent oxidation. After the leaves are steamed, they are hand rolled into cakes, balls, and spindles. Sencha tea is acclaimed for its balance of acidity and sweetness. Sencha tea boasts a slightly savory taste with a mild body. This tea has a sweet grassy flavor and notes of pine or melon. The highest quality teas offer a more complex flavor profile that includes contrasting yet balanced flavors. There are two different types of sencha green teas, which are classified based on steaming methods: Asamushi and Fukamushi. Asamushi teas are considered the traditional variety and are steamed for 30 to 60 seconds. These teas are light yellow when brewed and offer a potent sweet flavor. Fukmushi teas are relatively new and involve steaming the tea leaves longer. This produces sencha teas that are dark and cloudy in comparison to traditional asamushis. Fukamushi sencha also boasts a stronger flavor that tends to be earthier. Gyokuro tea is made from green tea leaves of the Camellia sinensis plant. What sets this tea apart from other Japanese green teas is that the tea leaves are grown in the shade for the last month before harvest. The shade encourages the leaves to ramp up production of cholorophyll and other healthy plant nutrients. This results in a delicate sweet flavor and a potently healthy tea. The shade also prevents the amino acid L-theanine from converting into a tea catechin. The high concentration of L-theanine in Gyokuro tea results in a smoother delivery of the caffeine. That means you get the energy boost without the peaks and dips associated with a cup of coffee. 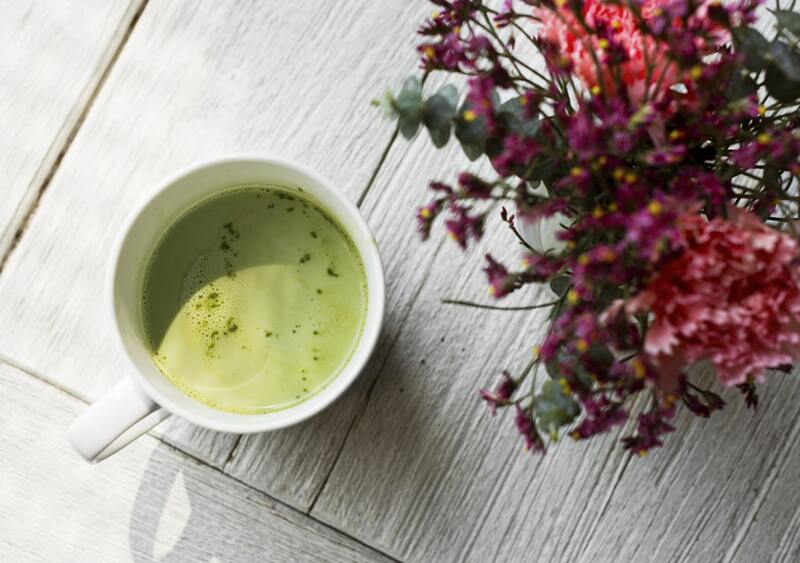 Gyokuro tea has a creamy body and savory flavor similar to seaweed. These flavor notes are balanced by a sweet finish and soft aroma. Genmaicha green tea blends green tea leaves with popped brown rice kernels. It boasts a toasty flavor and full body. Genmaicha tea features a hearty flavor that is similar to mild coffee. The roasted rice kernels balance out the astringent flavors of green teas, making this a smoother beverage. This tea was originally termed 'the people's tea' because it was far more affordable since the tea contained both cheap rice kernels and higher cost tea leaves. The tea was initially marketed as a tea anyone could afford. Today, this tea is acclaimed for its unique flavor and aroma. Genmaicha tea is often called 'popcorn tea' because of the popped rice kernels. 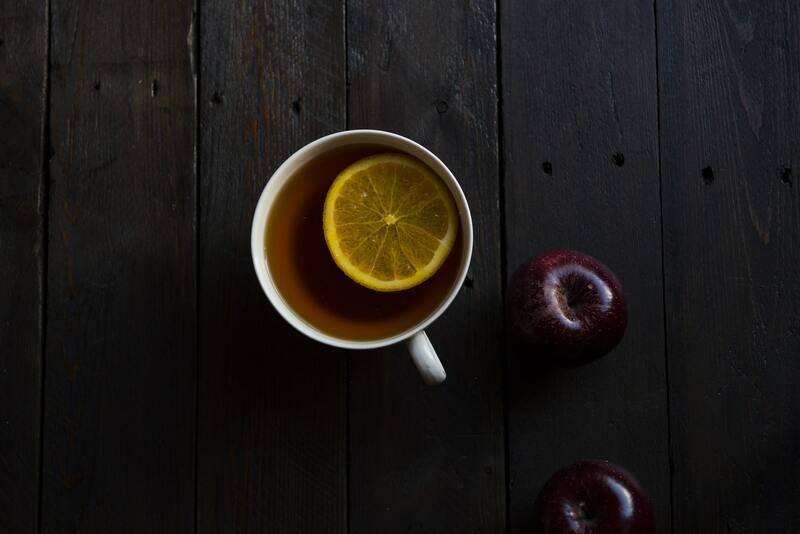 This tea is consumed before or after a meal as it cleanses the palette. Genmaicha teas should be brewed at slightly higher temperatures than normal green teas because rice releases flavor at higher temperatures. Matcha tea is made from the stone-ground leaves of the tea plant. This green tea powder is famous for its use in culinary dishes as well as in matcha lattes. 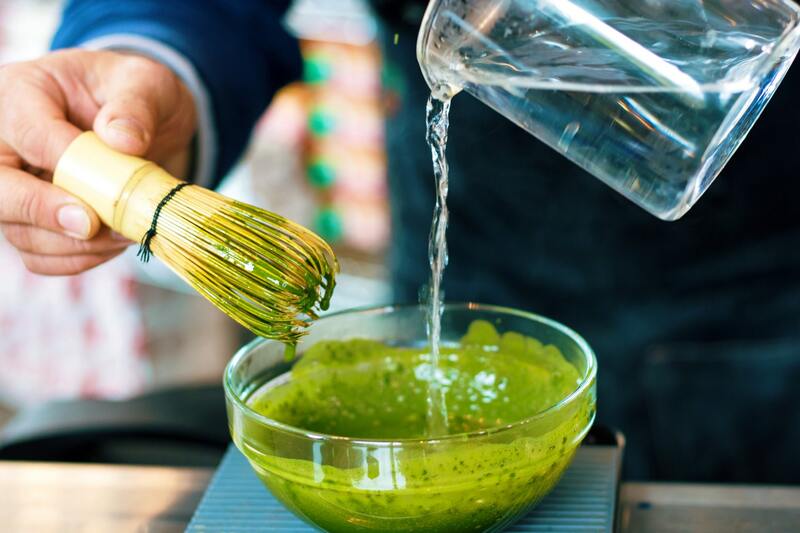 Matcha green tea is made using shade-grown sencha green tea leaves. The leaves are harvested by hand and transported to a production facility on the tea estate. The green tea leaves are spread out on bamboo mats where they are steamed and dried. Once the leaves are dry, they are ground into a fine powder either by hand or in a slow-turning mill. 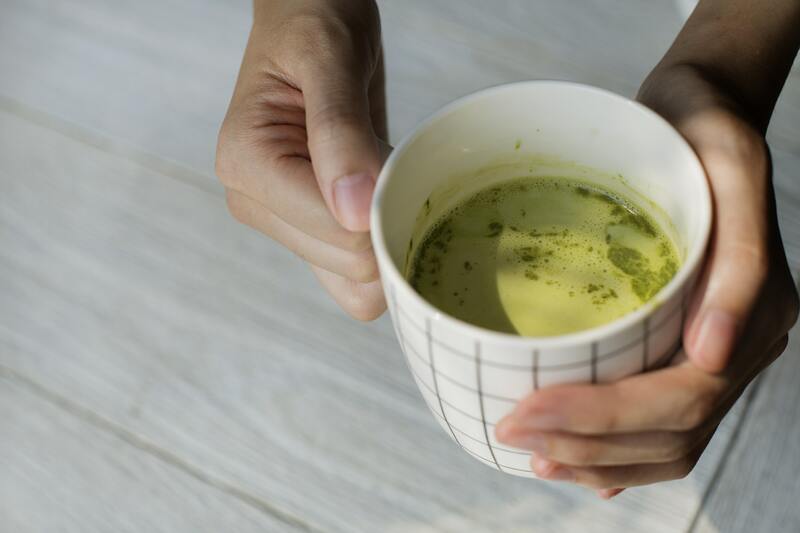 Matcha powder is considered one of the healthiest green teas on the market. This is because you consume the entire tea leaf rather than simply infusing the leaves and removing them to drink. Matcha green tea contains the highest amounts of L-theanine and other healthy plant compounds. Matcha tea also enables your body to absorb vitamin E and dietary fiber, which are normally hard to absorb when drinking normal green tea. Matcha contains the highest concentration of antioxidants as well, making this tea a true powerhouse when it comes to health benefits. Hojicha green tea is notable for its low caffeine content. This tea is also one of the few Japanese teas that is roasted rather than steamed. The tea leaves are harvested and pan-fired to prevent oxidation. The result is a nutty flavored tea with a roasted aroma and undertones. Hojicha tea is also different from other green teas in that it does not have a green color when brewed. This tea is actually a soft brown color when infused in hot water due to the roasting process. The low caffeine content makes this tea popular among the elderly and young children. Hojicha tea is one of the first green teas children are introduced to. This tea should be brewed with hot water for only a short period of time to prevent green tea that tastes bitter. Kukicha green tea is unique in that it is not made using the leaves of the tea plant. Instead, this green tea is made by infusing the stems, twigs, and stalks of the tea plant in hot water. Kukicha tea is often called Bocha or stick tea. Kukicha is made using only Sencha or Gyokuro tea leaves and is also known as Karigane tea. The flavor of this tea is nutty with a creamy full-mouth feel. Kukicha is also widely used as a digestive aid thanks to its low caffeine content and anti-inflammatory properties. Guricha tea is a rare Japanese tea prized by tea connoisseurs across the globe. Guricha tea accounts for only about five percent of total tea production. The rarity of this tea makes it a prized commodity that can fetch high prices at auction. Guricha tea is mainly produced on Kyushu island located in the Ureshino area of Japan. This tea leaf is characterized by a special shape that looks like a comma. 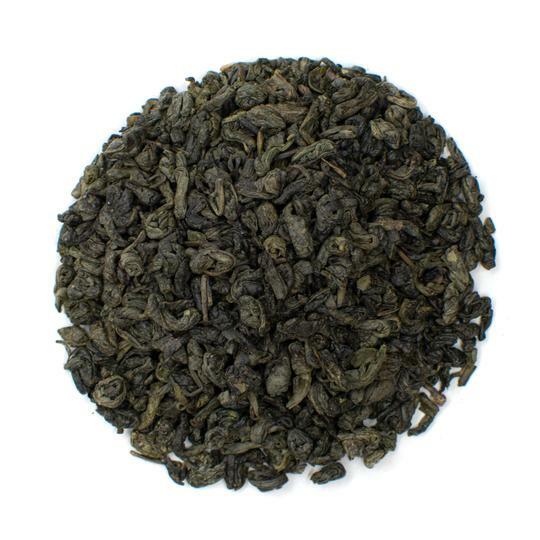 Guricha loose leaf tea is dark green in color and offers a sweet flavor profile. If you can find it, this is one of the best teas from Japan. Uji tea is made from tea leaves cultivated in Uji, Kyoto. This tea has deep cultural and historical ties in Japan. Uji tea was transported as part of a special ceremony over 200 times during the Meiji era. The tea was brought to the shogun—military leader—of Japan as a show of respect and dedication. The tea is most revered for its cultural significance rather than any taste differences. Green tea should be brewed using water between 150 and 180 F. The temperature depends on the type of green tea you are brewing. Follow the instructions on the tea bag or loose leaf tea for the best results. The Japanese deliver when it comes to high quality green tea. Whether you try an organic green tea or a high quality matcha powder, you're sure to find a flavor you love. 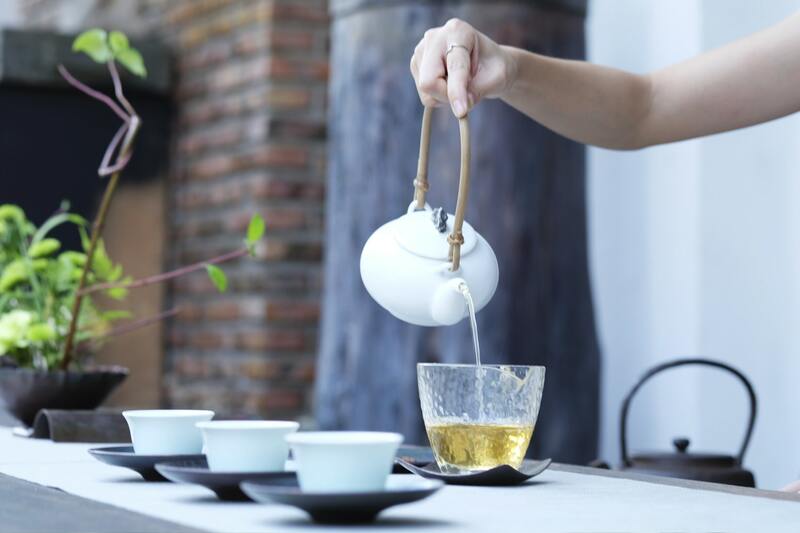 Tea has played an important role in both the Asian and western realms. 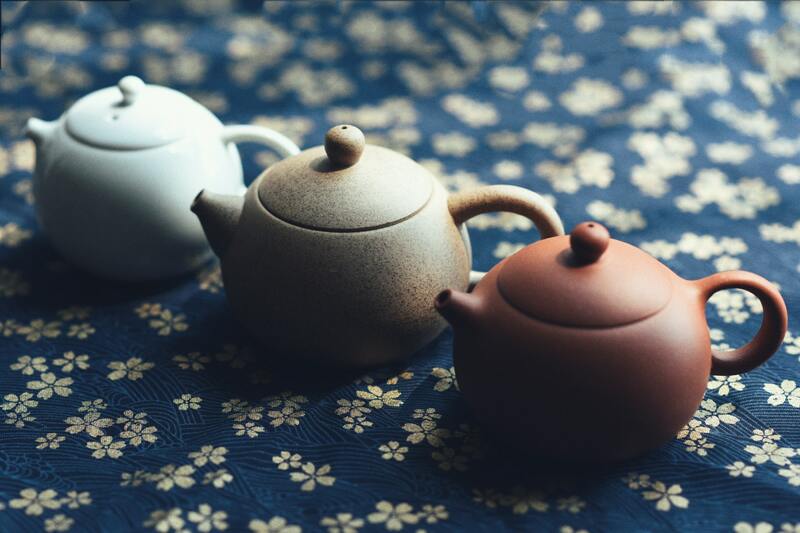 Discover the different flavors of Japanese teas with these delicious varieties. Drink tea and enjoy the rich flavor and history of Japan.